In 'Soy Yo' Music Video, Bomba Estereo Pays Tribute To 'What's Inside Of You' The music video for the Colombian band's song "Soy Yo" has made headlines this week. The group's Simon Mejia tells NPR's Rachel Martin why it's being called an ode to little brown girls everywhere. Sarai Isaura Gonzalez stars in the music video to Bomba Estereo's "Soy Yo." 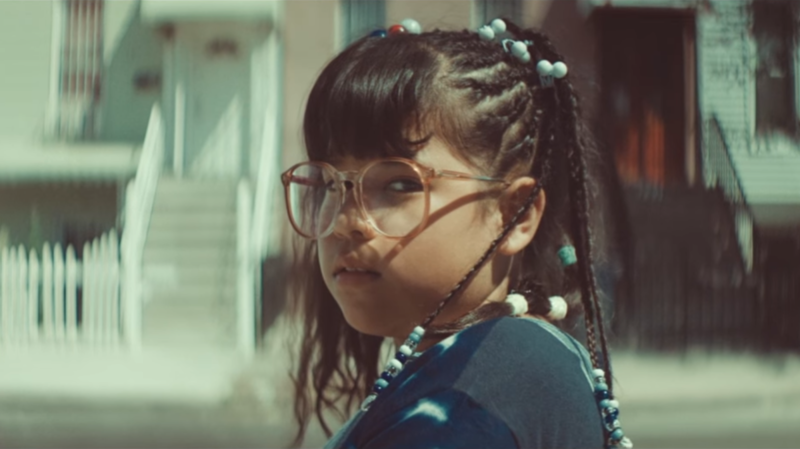 Since the music video dropped last week for Bomba Estéreo's 2015 hit, "Soy Yo," the video has drawn attention — and plaudits — across the world. It's been called an ode to little brown girls everywhere. A swaggier Little Miss Sunshine. An empowerment anthem. One half of the Colombian electro-cumbia group, instrumentalist Simon Mejia, talked with NPR's Rachel Martin about the song. Mejia, who records with vocalist Liliana Saumet, tells Martin about how the video came about, how they found their charismatic young actress — and how she came by those bomb dance moves. "I don't know," Mejia says, "but surely she has a rhythm inside her." It's a very beautiful piece with this Danish director [Torben Kjelstrup]. He came with this very, very special idea about this girl that goes to the parlor thing and does her hair and everything and goes into the street. And [she] is being free — and being free about what she feels she is about, her individuality. It was a whole process that the film crew did. They did a very precise casting looking for this particular and special girl, and they came up with his girl. They showed us and we thought it was perfect because she represents a whole community. She can be from everywhere in Latin America from Mexico to even Argentina she could be anyone. It's perfect. She represents a whole community who are immigrants living in a foreign country, so she's representing what's happening in the world. We have lots of immigration issues in the states — that is, people coming from poorest countries to developed countries. This reflects a whole cultural and social situation. For example, in Colombia, we were making this whole campaign around the song. We were having big issues in the schools around bullying; recently a small kid was gay, and he was having so much bullying in the school that he committed suicide. So we're trying to empower people to feel that it doesn't matter if you're different or if you're from one country or the other or you're black or you're white or you're gay. What's important is what's inside of you, and you have to fight for that. I think the video brings this message along.